A free, non-promotional impartial guide to help make the best possible autoclave selection has been published. Titled the AUTOCLAVE KNOWLEDGE BANK and sponsored by Priorclave, this booklet guides readers through key points to consider such as autoclave style from benchtop, top and front loading, pass-through, chamber style including cylindrical or rectangular and heating source that should help to narrow down steam steriliser selection. The Autoclave Knowledge Bank check book outlines the reasoning for vacuum autoclaves, why to choose steam jacketed autoclaves, water condition, hygiene and environment issues, recording keeping and proving sterilisation, as well as position and installation. When specifying or purchasing expensive and complicated equipment, it is essential to be able to ask the right questions in order to get the right answers and make an informed decision. 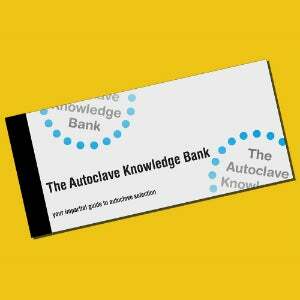 The Autoclave Knowledge Bank could save companies time and money. It is important to think about what you are going to put into the autoclave to make sure that the autoclave you buy has the right best specification to process it effectively and efficiently, especially if you are going to have to prove this to a certifying body. It is always advisable to speak with the supplier or manufacturer direct before finalising the autoclave choice. The Autoclave Knowledge Bank Check Book provides information to help discussions and questions to ask of prospective laboratory suppliers and manufacturers. The Autoclave Knowledge Bank Check Book is an impartial guide and provides insight into key factors that can help to make the right decision before making an important laboratory autoclave purchase. Priorclave has been designing and manufacturing research sterilisers and laboratory autoclaves and has achieved a global presence. The Priorclave brand was developed for various sterilising applications within industrial sectors such as bio and microbiology, pharmaceutical, education, healthcare, food and dairy, chemical and general lab. The extensive range is designed and manufactured at the company’s dedicated UK laboratory autoclave production facility. Priorclave brings together several aspects of British engineering, including a strong design, skilled technicians, modern production techniques, robust finish and stringent quality assurance procedures. The company produces laboratory autoclaves that deliver an assured sterilisation process with repeatable performance, all in a build quality that ensures an extended product life. A copy of the new booklet can be requested direct from the sponsors by contacting sales@priorclave.co.uk.